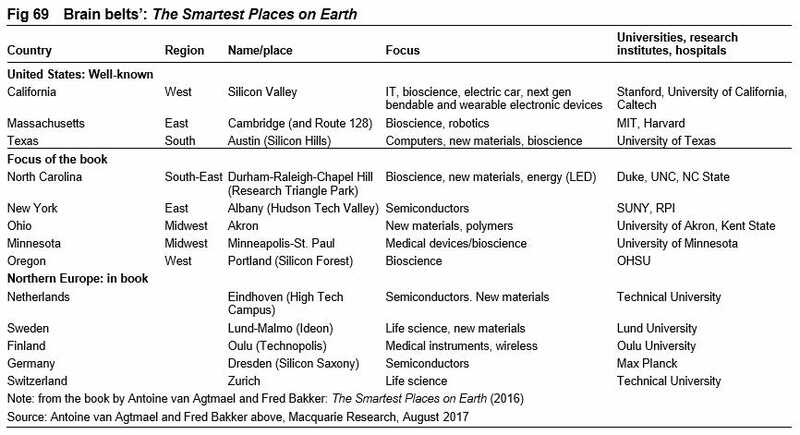 According to an article in Business Insider, "13 'brain belts' Where the World's Smartest People Reside", Akron, Ohio made the list. Analysts from Macquarie Bank have outlined 13 places where the world's best and brightest tend to cluster. Macquarie's team referred to such regions as "brain belts" — areas which have developed into hubs which attract the smartest people to work in different areas of cutting edge technology. The list is based on research in a 2016 book by Antoine van Agtmael and Fred Bakker called "The Smartest Places on Earth." Macquarie said that van Agtmael and Bakker identified many other places in addition to the table below, and "virtually all were in North America and Europe." As part of their research, Macquarie's team spent time in Silicon Valley and it left them optimistic about the positive impact of technology in the global economy. They noted that the motivation for van Agtmael and Bakker stemmed from an idea that focus was moving away from the cheap manufacturing. "This led to an understanding that cheap is giving way to smart, where high value-added products are being created in collaborative environments, in 'brain belts,'" Macquarie said. While the research certainly has a northern hemisphere bias, the authors took specific aim at Asia as being too rigid in its thinking and processes. "Research facilities with deep, specialist knowledge; educational institutions; government support for basic research; appealing work and living environments; capital; and, most important, the atmosphere of trust and the freedom of thinking that stimulates unorthodox ideas and accepts failure as a necessary part of innovation—different from the hierarchical, regimented thinking so prevalent in many Asian and MIST economies." MIST stands for Mexico, Indonesia, South Korea, and Turkey. The research in these intelligent clusters spans the full spectrum of tech innovation, from expensive new product development to test-runs for automated manufacturing processes using 3D printers. While many have raised concerns about the impact of technology on employment, Macquarie is optimistic about the trickle-down effect from innovation. They cited further research from a 2013 book by Enrico Moretti called "The New Geography of Jobs," which argued that "for each new urban high-tech job there are five additional jobs created, three for professionals and two for lower-wage non-professionals".